Even by the stringent standards set by former chief election commissioner T N Seshan, who many felt robbed Indian elections of the theatrics, noise, colour and commotion that essentially celebrated democracy, electioneering has been unusually quiet in rambunctious western Uttar Pradesh. Days before campaigning for the first phases closes on April 9, an occasional roadshow or a “nukkad sabha” (street-corner meet) and lately a few rallies broke the placidity. What does the quietude signify? Apathy or pre-determined choices that make even a long and arduous trudge to a rally superfluous? Neither, as the extraordinarily large and surcharged turnout at the first rally of the Opposition “gathbandhan” (coalition) in Deoband on April 7 showed. Addressed jointly by the Bahujan Samaj Party (BSP), Samajwadi Party (SP) and Rashtriya Lok Dal (RLD) chiefs – Mayawati, Akhilesh Yadav and Ajit Singh, respectively – the congregation was huge by the levels witnessed at similar shows put up by the BSP and SP. 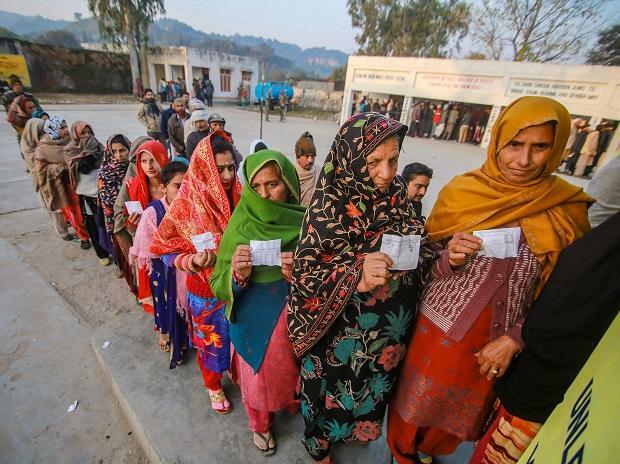 However, the collective exuberance on display at Deoband in Saharanpur district is hardly, if ever, seen in towns and villages where voters gave an impression that the elections were a five-year ritual to be gone through. Muslims, scorched by the communal violence in Muzaffarnagar in 2013, were silent, refusing to let on their electoral preference. For instance, in Meerut, where both the “gathbandhan” and the Congress are in the contest against the sitting Bharatiya Janata Party MP, Rajendra Agarwal, Muslims said a percentage of their votes would “automatically” go towards the Congress because of “old loyalties” – this, despite the fact that the “gathbandhan’s” candidate was Haji Mohammad Yaqoob of the BSP, while the Congress nominee was Harendra Agarwal. In Saharanpur, both the Opposition candidates were Muslims: Fazalur Rahman of the BSP for the “gathbandhan” and Imran Masood of the Congress. Masood was believed to be the “stronger” of the two, with deep local networks. In 2014, he came a respectable second to the winner, Raghav Lakhanpal of the BJP. Congress President Rahul Gandhi and General Secretary Priyanka Gandhi Vadra had a roadshow in Saharanpur on Monday that locals claimed consolidated Muslim support for Masood. Some local observers believed that the tactic of indicating a division of minority votes might be deliberate, to confuse the BJP. The Dalits, who have a large presence in each constituency polling on April 11, made common cause with the Muslims because they said if the minorities felt persecuted and harassed by the Yogi Adityanath government, their plight was no better. The tipping point for the large-scale return of the Dalits to the BSP — a large section voted for the BJP in 2014 Lok Sabha and the 2017 Assembly elections — was the violence at Shabbirpur village in May 2017. Shabbipur, 25 km from Saharanpur, has a population largely consisting of Rajputs and Dalits who supposedly co-existed in harmony. But on April 14 last year, when the Dalits wanted to install a statue of Bhimrao Ambedkar on Ambedkar “Jayanti” in their Ravidas temple, the Rajputs protested. The local administration denied permission to the Dalits. Days later, the Rajputs celebrated a festival to honour Maharana Pratap in the adjoining Simlana village, armed with swords, metal rods and bottles of petrol. They played loud music and started a procession that entered Shabbirpur’s Dalit hamlets. When the Dalits protested, the Rajputs raised provocative slogans against Ambedkar. One of them, Sumit Singh, broke into the Ravidas temple and allegedly set the idol afire. He collapsed and died shortly thereafter. The post-mortem report said his death was caused by suffocation from heavy smoke. The Rajputs immediately retaliated, assaulted the Dalits and torched their homes. ALSO READ: Festive democracy, yes, but accountable? The Uttar Pradesh government was silent about the caste violence, as was the Centre. Mayawati responded after days because the Bhim Army stepped in before her to demand compensation for the Dalit victims and she perceived the Bhim Army leader, Chandrashekhar Azad, as a potential rival. Azad sent his workers to the Deoband rally to mark his “solidarity” with the “gathbandhan” and dispel the rumours that he had allegedly connived with the Congress to work against the BSP in the Lok Sabha polls. Dalits and Muslims together vastly outnumber the other communities in the western constituencies. However, because Mayawati had thrice taken the BJP’s support to install herself as the chief minister, the minorities were sceptical of her intent and agenda. This is where the alliance with the SP came in useful; for most Muslims, Akhilesh and his father Mulayam Singh Yadav remained the first choice. Early on, the BJP figured out the mathematical strength of the Muslim-Dalit pairing. Before the 2017 UP elections, a top BJP source told this correspondent that if this combine worked in Mayawati’s favour in the first phase of polling that was also in west UP, his party would be in trouble. Therefore, the BJP quietly spread the word through its networks that it was not the BSP but the Congress-SP alliance that was set to defeat the BJP. The propaganda worked to the BJP’s advantage. Muslims, who anyway had reservations about Mayawati, rooted for the Congress-SP that lacked a critical mass in the western region to challenge the BJP and allowed it to have a walkover.